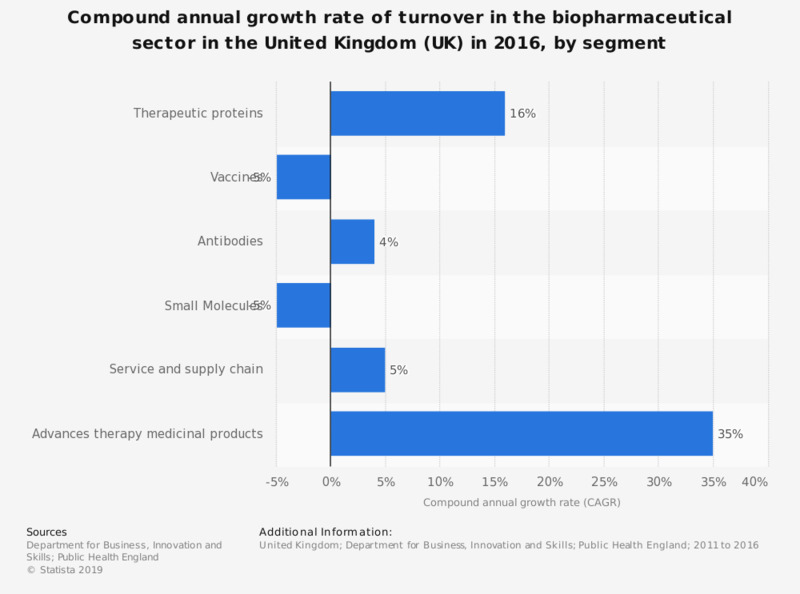 This statistic displays the compound annual growth rate (CAGR) of turnover in segments of the biopharmaceutical sector in the United Kingdom (UK) between 2011 and 2016. The biopharmaceutical sector researches and produces pharmaceutical medications which are extracted or semi-synthesized from a biological source. These can include vaccines, antibodies, blood and tissue products and therapeutic proteins. The advanced therapy medicinal products segment experienced the highest growth rate during the five year period at 35 percent. This was followed by the therapeutic proteins segment at 16 percent. Both the vaccines and small molecules segment saw a decline of five percent during the five year period.